Online brokerage firms have replaced many brick-and-mortar offices. 3. Do You Pay a Stock Trade Fee to Buy and Sell? One of the first decisions an investor has to make at the onset of investing is whether to use a discount or full-service stockbroker. Discount brokers offer fewer services than full-service brokers and their fees are generally lowest. While discount brokers charge investors for each trade or each time they buy or sell a stock, mutual fund or bond, full-service brokers generally adhere to a fee structure that is based on the value of an investor's account. Discount stockbrokers offer the bare bones of financial services. For a fee, they perform the buy and sell orders that investors place online. The field is highly competitive, and discount brokers often lower their fees in hopes of capitalizing on the volume of trades while capturing market share from their rivals. In 2012, the average discount broker fees declined to $7.96 for each trade from $8.27 per trade in the previous year, according to a 2012 "Smart Money" article. Full-service brokers offer clients a fee-based service rather than charging for each individual market transaction. This approach is customary for stockbrokers who provide clients with access to research and educational sessions in addition to personal investment advice and performing transactions. Full-service brokers charge clients a yearly fee of between 1 percent and 1.5 percent of the total amount of assets managed and do not tack on additional expenses for individual brokerage trades, according to a 2013 "Kiplinger" article. A financial adviser differs from a stockbroker. 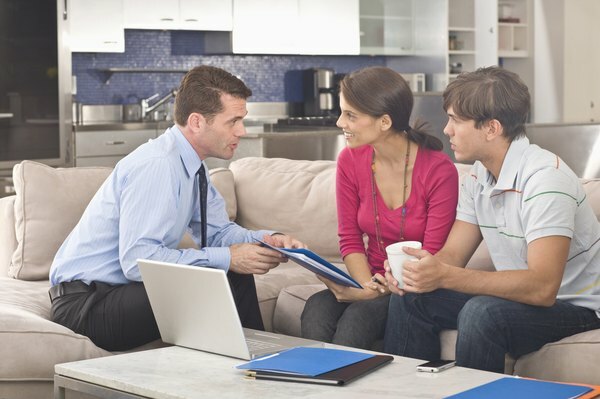 An adviser often becomes personally involved with a client's financial situation and provides advice on many financial matters, from which mutual funds to buy to managing an estate. Traditional commission-based stockbrokers are increasingly becoming fee-based financial advisers, according to a 2011 "Wall Street Journal" article. The article points out that advisers charge higher fees for managing equities versus bonds, which could motivate advisers to invest more heavily in stocks over bonds. If an investor does not read the fine print on his account documents, he may wind up paying hidden fees. For instance, if an investor decides to change brokers and transfer his assets to another firm, he may be charged as much as $100 for account transfer fees, according to a 2012 "USA Today" article. If an investor fails to make a trade during a specific period, she could be hit with an inactivity fee. These fees could be waived if the investor maintains an account balance above a certain threshold. Bloomberg Business Week: Fee-Based Accounts -- A Poor Fit for Investors?